The Domain Eukarya is made up of eukaryotic organisms. Eukaryotic organisms have membrane bound organelles, such as mitochondria. Kingdom Animalia is also called Kingdom Metazoa. It is made up of organisms that are heterotrophic and multicellular (Myers,2011). The word Mollusca comes from the Latin word Molluscus, which means "soft bodied." The characteristics of the molluscs include bilateral symmetry, an open circulatory system, and many, though not all have a shell (Ramel). The Class Gastropoda is made up of snails and slugs. Many gastropods are recognized by a single spiraled shell that the animal can revert back into for protection. All gastropods can also be identified because they go through a process called torsion, a rotation of the visceral mass (Myers & Burch, 2011). 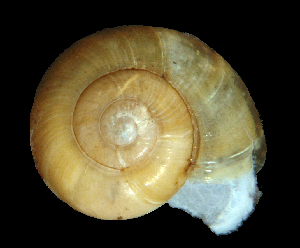 The Order Stylommatophora is characterized by eyes on the tips of the tentacles and all of these snails and slugs are terrestrial (Webster). Snails of the Family Zonitidae are also called "true glass snails" because their shells may be glassy or translucent and they can fully withdraw into their shells (Nordsieck, 2009). Why is Nesovitrea electrina called the Amber Glass snail? The Nesovitrea electrina is called the Amber Glass snail because it is a snail from the group known as "true glass" snails. The species name, electrina, means amber, which is a brown color.